This is a truly joyful time of the Church year as we conclude the long sequence from Advent to Pentecost with these great feasts celebrating central truths of our faith: the Trinity last Sunday, and the Eucharist this week, followed by the Sacred Heart on Friday. One might ask, What is the relationship between the Trinity and the Eucharist? Why does the one feast follow the other? There is, of course, a strong inner unity between the doctrine of the Trinity and the doctrine of the Eucharist. It is striking, for example, that Jesus’ clearest teaching on the Trinity—the relationship between the Father, the Son, and the Spirit—is all delivered during the Last Supper Discourse (John 13–17), in the context of the institution of the Eucharist. In a sense, it is in the Eucharist that the reality of the Trinity becomes most personal to us, and is applied to each one of us. Yes, we speak of receiving Jesus “body, blood, soul, and divinity” in the Eucharist, but we must remember that in Christ we also receive the Father, for “the Father is in me and I am in the Father” (John 10:38), and the Spirit, who is the bond of love between the Father and Son. So there is a sense in which the whole Trinity comes to live within us through the Eucharist: “If a man loves me, he will keep my word, and my Father will love him, and we will come to him and make our home with him” and, “the Spirit of Truth … dwells with you, and will be in you” (John 4:23 and 4:16). The readings show us that the Eucharistic meal is the culmination of a tradition of sacred covenant meals throughout salvation history. This is the covenant making ritual at Mount Sinai, after the LORD had given the Ten Commandments and before the people had sinned with the Golden Calf. A “covenant” is the extension of kinship by oath. It is a way of taking a non-family member into your family. This covenant-making ceremony represents a sort of adoption of the people of Israel by the LORD (Jer 31:20); or from another perspective, a marriage of Israel to the LORD (Ezek 16:8). Adoption and marriage were the primary uses of covenant in the ancient world. Let’s talk about the blood ceremony Moses performs. The blood is sprinkled both on the altar (representing God’s presence) and the people. 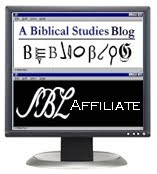 This means both God and the people are entering into the covenant together. The blood has at least two symbolisms. First, kinship: God and Israel now share the same blood. When someone is related to us, we say, “He’s blood to me.” There is also the expression “Blood is thicker than water.” So to this day, we use the word “blood” to denote kinship. In ancient times it was the same. Sharing the same blood, Israel and the LORD are now family. But the blood has a second meaning as well: death. The blood came from slain animals, and a secondary meaning of accepting the sprinkled blood was: may my blood be shed, like these animals, if I fail to keep my covenant commitments. The sacrifices that often accompanied covenant-making rituals symbolized the consequences of covenant violation. More positively, the sacrifices also provided food for a meal. Families eat together, so a common meal often served as part of the ceremony of covenant-making (Gen 31:44-46). Just after our First Reading, if we continue on in Exodus 24, we see that Moses and the elders of Israel have a meal with God on Mount Sinai after the blood ritual (Exod 24:11). This is why bishops will refuse the Eucharist to persons who flagrantly reject the Gospel and the teachings of the Church by their public words or actions. It is for their safety, so that they do not bring divine judgment on themselves. Before leaving this reading, we should note the “young men” who assist Moses in the priestly duty of offering sacrifice. Although the text is not explicit about who and how many these young men were, Jewish tradition understood that there were twelve of them—a firstborn son from each of the twelve tribes. The firstborn sons of Israel had been “consecrated,” after all, during the Passover event (Ex 13:2,12), and “consecrated” often has the force of “ordained” in the Old Testament. The use of this Psalm for the celebration of the Eucharist is highly significant. Psalm 116 is part of the set of Hallel Psalms, consisting of Pss 113–118. These psalms were and are recited or chanted during the Passover liturgy. Our Lord and the Apostles certainly would have recited them, including our text Ps 116, at the Last Supper. The Hallel (“Praise”) Psalms 113–118 are mostly psalms of thanksgiving or Todah psalms. The Todah was particular kind of sacrifice mandated by Moses in Lev 7:11-15. Unlike other sacrifices, the Todah was not offered in atonement for sin, but in thanksgiving for some act of deliverance that God had performed for the worshipper. The Todah ritual also included the consumption of much bread along with the meat of the sacrificed animal—it was a festive meal. In fact, the worshiper was forced to have a festive meal, because the entire sacrificial animal had to be eaten the same day that it was offered. For this reason, friends and family came to the sacrifice to participate in the feast afterwards. In Jewish thought, the Passover sacrifice was a form of the general category of Todah sacrifices. It had the following distinctive marks of the Todah: (1) it was offered in celebration of God’s deliverance, (2) it included the eating of bread, (3) it had to be eaten that same night (cf. Ex 12:8; Lev 7:15). Therefore, the Todah Psalms 113-118 were highly appropriate to chant during the consumption of the Passover sacrifice. As Christians, what is our appropriate response for God’s goodness to us? To participate in our “sacrifice of thanksgiving,” the Eucharist (Gk. eucharisteo = “to give thanks”). In gratitude for saving us from sin, death, and the devil, we offer back to God the very best that we have: the body of his Son, Our Lord Jesus, whom the Father has given us. Let’s focus on the last verse, vs. 15, underlined above, which contains the heart of the whole covenantal theology of Hebrews. The translation used in Mass is quite good in this instance, because it renders both occurrences of the Greek word diatheke here as “covenant,” which some translations fail to do. The author of Hebrews is saying the following: Christ’s death is the “death that has taken place for deliverance from transgressions under the first covenant.” The “first covenant” referred to here is the covenant of Sinai, which we saw being made in the first reading. This covenant involved a curse of death for any violation. As we saw, that was part of the meaning of the blood ritual: “May my blood be shed if I break this covenant.” Yet Israel did break the covenant again and again, starting with the Golden Calf. And each individual Israelite personally broke the Ten Commandments, as we all do. What then saves us from the curse of death for violating that covenant? Christ’s death does. He dies on our behalf, in our place. But its deeper than that. Through baptism, we actually participate in Christ’s death. In a real if mysterious way, baptism is a death that we undergo (Rom 6:3-11) that fulfills the curse of the first covenant. Having suffered the worst that the first covenant can do to us, we are free to enter into the “new covenant,” which promises an eternal inheritance—not a temporal, physical inheritance of the land of Canaan as in the first covenant, but eternal life with God in his presence (cf. Heb 12:18-24). In this Reading, the theme of blood is also strong: the ineffective blood of bulls and goats is contrasted with the effective blood of Christ. This brings up the contrast between the way blood is treated in Old Testament sacrifice and the way it is treated in the New Testament Eucharist. In the Old Testament, the consumption of animal blood was forbidden, because “the life is in the blood,” and God did not want his people to share in animal life, that is, to be debased to the level of animals (Lev 17:10-12). But now in the New Covenant, God commands the drinking of the Eucharistic blood of Christ— “unless you drink my blood you have no life in you” (Jn 6:53)—because He desires us to share in divine life. For the Eucharistic blood is the blood of Christ, and thus the blood of God. There is quite a bit that can be said about this passage, but we’ll focus on the distribution of the wine and bread. 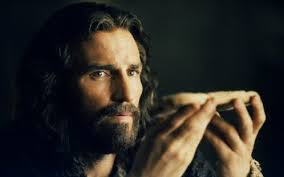 Breaking the bread, he gives it to his disciples and simply declares “This is my body.” He doesn’t say it symbolizes or represents his body, but simply that it is his body. Let it never be said that traditional Protestants interpret the Bible “literally” whereas Catholics interpret it “figuratively.” That is far too simplistic: in key instances this caricature is precisely reversed. The irony was not lost on me during my own journey into the Catholic Church. When debating Catholic doctrine back in 1999, I found myself unable to argue convincingly against my Catholic friend who was insisting on the plain sense of Scripture, while I was trying to avoid it. That friend later became my sponsor when I received confirmation. Considering that John Calvin and Martin Luther revered St. Augustine, as Lutherans and Calvinists do to this day, I find it remarkable that so few Protestants in these traditions are aware of the sacramental realism of this great Church Father, and how blunt he could be on the identity of the Eucharist with Christ’s body. As we said, the Passover was considered a form of the Todah, so the cup Jesus distributes is, in a sense, the libation cup or drink offering, the “cup of salvation” of which Psalm 116 spoke. When Jesus says “this is my blood of the covenant,” he is drawing a straight line back to Exodus 24:8, the only place in the Old Testament where the phrase “the blood of the covenant” is used. [i] Jesus is saying: “What I am doing here now with you, my apostles, is as momentous as what Moses did on Mt. Sinai.” Recall, too, that Moses was surrounded by twelve young men, the priestly firstborn of Israel. Jesus, too, has his “twelve young men,” who represent the new Israel, the spiritually reconstituted twelve tribes. Furthermore, these men will have the priestly duty of offering the todah sacrifice for the new covenant community. They, in turn, passed this priestly duty and authority on to those in succession from them. The Sacrament of the Eucharist is intimately tied to the Sacrament of Holy Orders. Priesthood and Sacrifice are bound to each other. The covenant ceremony at Sinai symbolized kinship with God, but the Eucharistic sacrifice instituted by Our Lord in the upper room actualizes kinship with God. The blood of Jesus is not merely symbolic but real. It has an actual effect on us, when received with faith: it “cleanses our consciences from dead works,” among other things (Heb 9:14). Since it is the body of Jesus Christ, and “you are what you eat,” we become assimilated into Christ, we share the body and blood of God, rightly understood, so that we are “partakers in the divine nature” (2 Peter 1:4) and “children of God” (1 John 3:1). This “divine filiation” is a shocking notion of intimacy with God that many other religions find misguided (e.g. Judaism, Buddhism) or outright offensive (e.g. Islam, Sikhism). Since it is totally deficient to contemplate You.